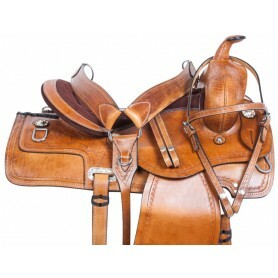 Be the envy of all your friends on the trail with this beautiful western saddle! 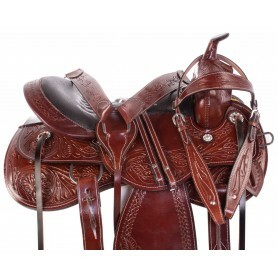 This saddle features a dark chestnut premium leather with a classic hand carved floral and basket weave tooling. 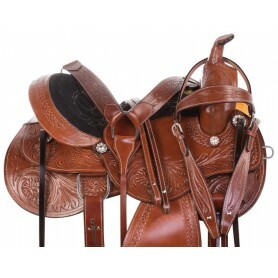 This classic western saddle is made from premium mahogany cowhide leather that is hand carved with a basket weave & floral tooling pattern. 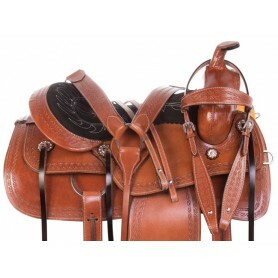 This classic wade tree roping saddle will be sure to turn heads whether you are out on the ranch or competing in a rodeo. The beautiful chestnut colored leather is accented with hand carved basket weave tooling that gives this saddle a classic look. One of our best selling pleasure trail saddles is now available in black! 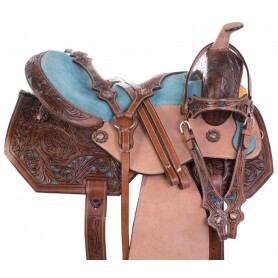 This amazing comfortable saddle features an intricate hand carved floral and basket weave tooling within the leather that gives this saddle a flashy, yet classic cowboy design. 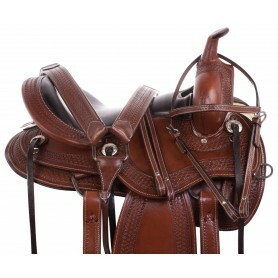 This beautiful pleasure saddle features a classic western design with a simplistic hand carved boarder tooling. The black suede seat is well padded with a quilt stitching that aids in extra grip while riding. This beautiful pleasure saddle features a classic western design with an intricate hand carved basket weave and floral tooling. 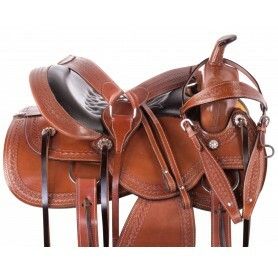 The brown suede seat is well padded with a quilt stitching that aids in extra grip while riding. 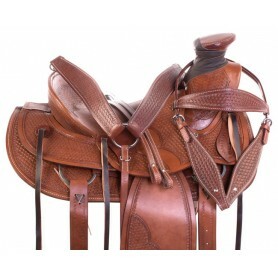 This saddle is made from premium chestnut cowhide leather with a classic hand carved basket weave tooling pattern that gives this saddle a classic, yet eye-catching look. 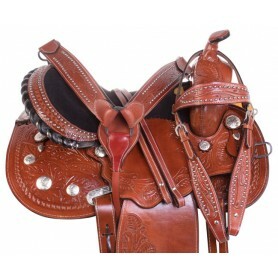 The saddle features numerous ties with silver conchos for accessory attachments that make it a perfect choice for riding the trails or out on the ranch.